Normally the utterance of the word ‘fruitcake’ can send shivers down the spines of children (and even adults at times). 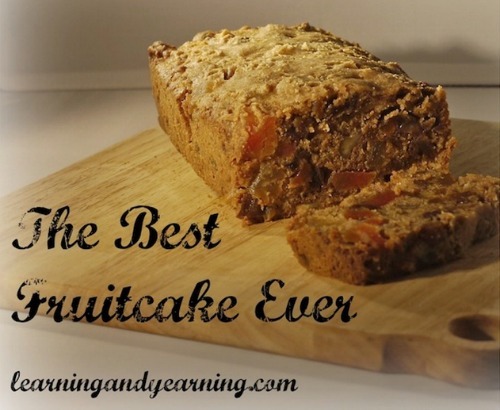 Most people flat out do not like fruitcake because of their negative experiences with it in the past. Many of us have encountered the failed fruitcakes with bits of fruit peppered unevenly throughout the unpleasing mush. Unfortunately, there are times when not even the fruit can salvage the dessert. Ultimately, despite how incredibly delicious fruitcake can be, many people still have trouble crafting a pleasant cake. However, on the other side of the equation is that when a fruitcake is done right, it can be great! Often, this is fully dependent on the baker’s abilities to craft a succulent and appetizing dessert, which is not as easy as it sounds. It’s fortunate that regardless of skills or circumstance, baking a fruitcake does not need to be so challenging as long as quick, simple, and clear instructions are followed. When we came across this delicious sounding recipe, it seemed too good to be believed but that couldn’t be further from the truth. With its detailed instructions, helpful hints, and comprehensive ingredients list, this guide will teach you how to bake a fruitcake that will delight and please your friends and family. In order to bake a delicious fruitcake, several ingredients must be purchased and prepared beforehand. There are also a few other secrets that must be followed for a successful cake. For example, softened butter is a strict requirement, and often substituting it for anything else will result in a poorer cake (unless the replacement is margarine). As for the key ingredient, the fruit of the fruitcake, a variety of fruit is available to the baker and can be included or excluded depending on his or her taste preferences (one of the best advantages to being the baker).